Description: Brown erect herb, usually 15–45 cm high, glandular-hairy with hairs on the inflorescence and stem 0.1–0.3 mm long, ± appressed and irregularly curled; stems usually simple, stout. 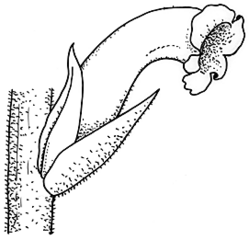 Leaves broad-ovate, 8–20 mm long, 2–5 mm wide. Spike at least half the height of plant, bracts often larger than leaves. Sepals 10–15 mm long, entire, obscurely ribbed, appressed on either side of the corolla, possibly sometimes also with a minute third sepal present. Corolla 15–20 mm long, purple at least on the lobes, glabrous but for small patches of irregularly curled glandular hairs; tube initially ascending then decurved; upper lip emarginate or 2-lobed and recurved, lower lip 3-lobed. Stamen filaments glabrous, thickened towards base; anthers drying white. Style whitish, stigma yellow. Capsule 8–10 mm long, enclosed in persistent corolla. Distribution and occurrence: Grows in sandy soils; confined to far north-west section of the State.